I had been coveting the beautiful magein david necklaces that began to adorn the necks of my classmates and their S.O.s (significant others) during our Year-In-Irael program. Sure, I had a few of my own including a stunning one I had been given as a naming gift when I was born. What I wanted, though, was a grown-up, simple one for daily use. Standing at the counter in a shop in The Cardo, something else caught my eye. Gold. Unadorned. Simple. Beautiful. Unexpectedly, and rather suddenly, the ones I had in mind seemed too ornate. Too fancy. 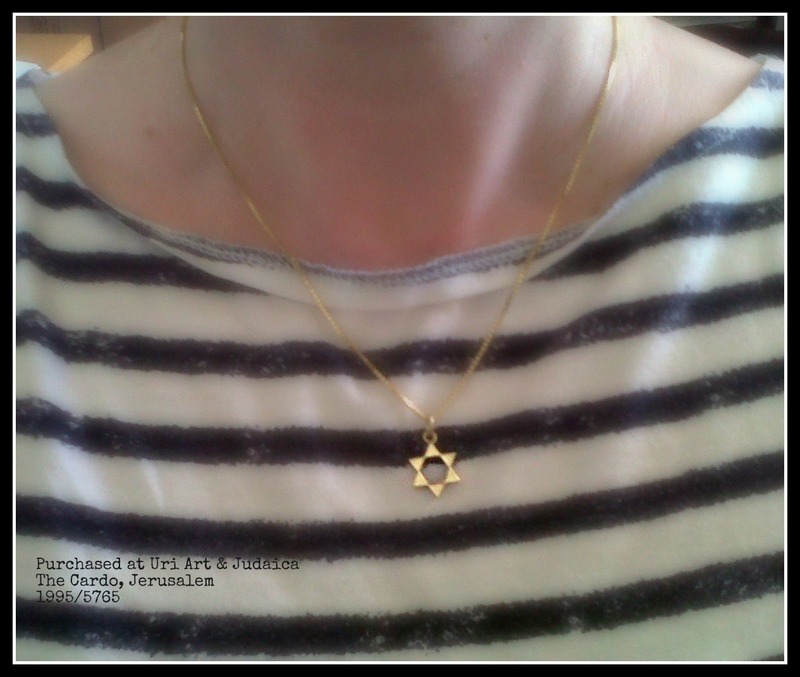 Too “not me.” The shopkeeper offered to wrap up the understated necklace. Lo todah. “No thank you,” I said as I clasped the link around my neck. So when Poppyseed lost it during Seder two weeks ago, I was crushed. PC had the good sense to tell me the following morning — and only after he, Poppyseed, and BubbeGiraffe had searched for it. Poppyseed swore that she had put it in PC’s coat jacket pocket. And PC swore that he checked the pockets. I believed them then as I believe them now. I do not know what possessed me to ask the woman at the dry cleaners if I might check the pockets before she took that very same coat from me. But I am grateful that I did. from → children, FS's Musings, Israel, Poppyseed, Prince Charming, You've got to be kidding me! I’m so glad your pendant came back to you. My friend recently lost her wedding ring and I had a feeling it would return. It did. Beshert. 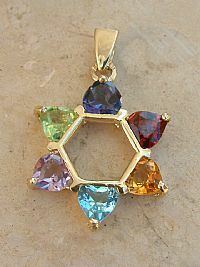 It is a beatuiful necklace! So glad you found it. Shabbat Shalom! So glad you found it. I kept meaning to comment here, but omg, I have the first one! Crazy! I don’t really wear it much. I wear the chamsa my friend brought me home from her trip to Israel. I have never been (yet) so I wear it to keep me safe – most especially when I travel. (hugs) I’m so glad it returned to you!